We talk a lot about setting expectations with your team. And, the reasoning makes sense: clear expectations keep employees focused. With clear goals and targets, it becomes much easier for employees to channel their energy and focus appropriately. Specific tasks and responsibilities also indicate to the employee what not to focus on, such as other team member’s projects or lengthy email chains. Even more importantly than what clear expectations provide are what they lessen: stress and frustration due to not knowing what their role is or how to perform it. While setting expectations is a crucial and initial step, those expectations are only as good as your follow up. Think about it this way: as a parent, you are constantly setting expectations for your children… “do this, don’t do that, behave in this way, don’t act like that…” and so on. But how many times did you tell your child something just once, and they immediately heed your advice? Probably not often! It’s only after repetition, reinforcement and most importantly, engagement, where they are involved in decisions, actions and choices, that the lesson truly sinks in. The same concept can be applied to your team. They’re not always going to “get it”, straight off the bat. As a leader, it’s your job to consistently reinforce and re-engage desired behaviors as they pertain to your organization’s purpose, efficiencies and effectiveness. When you think about setting expectations and goals, as well as your company strategy or mission, keep in mind the follow-up work: the re-engagement that is so crucial to the success of those actions. It’s kind of like making the cookie batter, but not baking the batter. And then not understanding why you don’t have a tray of freshly-baked cookies. You have to go the full mile, if you want full results. Here’s how to set those clear expectations, and then create a plan to follow up for each team and its members. Confusion is the number one killer of performance; remove confusion and you open the pathways to a more involved and focused team. Define the strategy and direction of the organization, as well as the individual goals. Revisit these points periodically to ensure your team is keeping on course. Organizational – These are more broad and encompass the mission and strategy of the company. Individual – These inform employee behavior and performance goals. Cultural – Just as important, these relate to day-to-day operations, teamwork, employee relations, team building, and so on. Acknowledging and defining each layer eliminates the guesswork. Taking the time to develop, coach and mentor your employees reaps multiple benefits. Employees feel more valued in the workplace and thus more engaged and enthusiastic when their leaders actively give opportunities to strengthen skills and performance. Employee development is a clear indicator of the type of behaviors and performance that are valued in the organization. 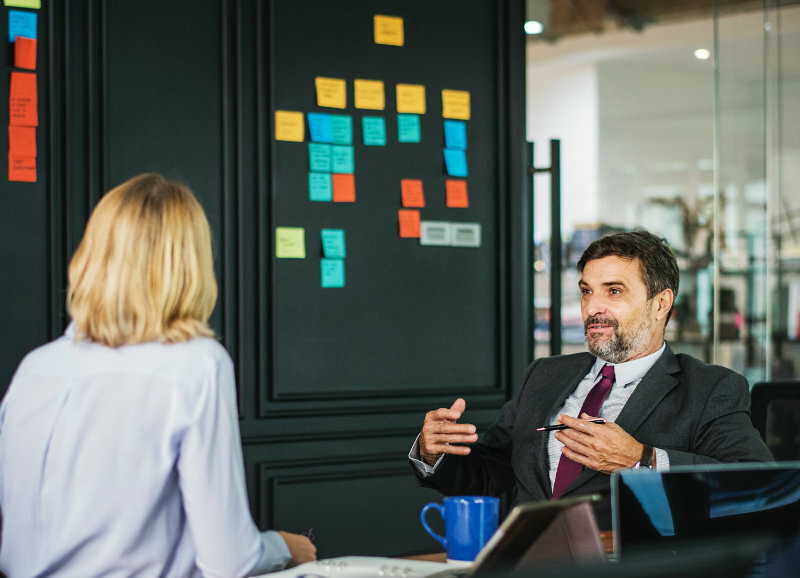 Finally, employee development goes hand-in-hand with feedback, where it creates open dialogue for how leadership and employees can both improve to achieve exceptional results. The feedback will be part of your plan to follow up and follow through, as it engages the team member and revisits goals. Does your organization need to find the right leadership? With tips like these and much more, we can help you find executive talent. Contact us here. What is just as important as setting clear expectations? Following through with them, as well as following up with team members. Here are our tips for what goals to get and why you should revisit them from time to time. Crimson Technology Partners provides executive-level leadership through advisory, partnership and program management services.